Below is the 2019 Dance Lineup listed from A-Z. It is currently being updated daily so please check back regularly to see who’s performing. 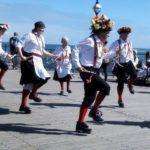 A mixed border morris side from Poole with an energetic, free-flowing dance style and we write many of our own dances. Dance group mixing Middle Eastern moves with modern music. Performing the North West style of clog. Performing clog routines from all over the UK, with step dances from the Isle of Man, Quebec and Cape Breton. Dancing a mix of Cotswold and Border Morris. A men’s Cotswold Morris dance team. A women’s Cotswold and Border Morris dance team. Performing Appalachian Step Clogging and British Clog Dancing to a variety of American, Irish and British acoustic folk music. A mixed Morris side based in Berkshire. They perform traditional North West Morris dances. A women’s Cotswold Morris dance team. A mixed Border Morris side. A mixed Morris side performing mainly Cotswold Morris. A mixed side dancing mainly in the Cotswold tradition. The side has a wide repertoire of dances, mainly in the Cotswold style. A ladies group set up during the folk revival in 1976, dancing Stave, Cotswold and some Border dances. Performing an interpretation of the ‘Border’ Morris dances collected in Worcestershire, Herefordshire and Shropshire. A mixed Cotswold Morris dancing side loosely based around South Wales. Performing the Border style of dances, originating in the English/Welsh border areas. A female North West Clog morris dance side who perform dances in the North West and step dancing traditions. 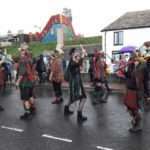 Molly Dancing originated in the English Midlands and East Anglia and is associated with Plough Monday. Performing a broad mix of Cotswold Morris styles, though many of the dances are based on a liberal interpretation of the Fieldtown Morris tradition. A group of students from Horizon Community College. A mixed group performing Cotswold Morris. They are a Morris dancing group, performing North West style clog dances. Performing the precision clogging style of Appalachian dance. 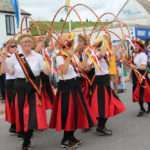 A ladies side and dance a variety of traditions including Cotswold, Stave, North West Clog and Garland. Performing North West Morris, which is one of the more spectacular, giving a noisy and colourful display. 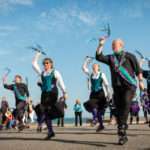 A Portsmouth based team who aimed to bring a lively new approach to folk-style dancing with influences from all traditional types of morris. A women’s team dancing in the North West style, based in Ash Vale on the Surrey/Hampshire border. A mixed men’s and women’s Cotswold Morris side based in North Harrow, Middlesex. Offers very colourful, energetic, fast, temperament and quite physical show based on Slovak dance. A women’s side based in Bath, performing North West Morris. A mixed Morris dance side, dancing mainly in the Cotswold and Border traditions. They began in the ‘North West clog tradition’ dances but now are adding other dances from other traditions, as well as making new dances of their own. A lively traditional style, with brightly coloured costumes and hard soled shoes with taps which emphasize the percussive element of Appalachian dance. A mixed Border Morris group. 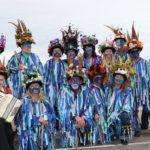 A women’s Northwest clog dancing group (with male and female musicians) based in Croydon. A mixed Morris side performing traditional Cotswold dances. Performing a style of English traditional dance called North West Morris. A Ladies only dance side performing in the North-West tradition. Dancing in the North West tradition, which originated in the cotton mills and factories of the North West of England. 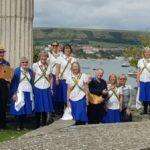 They are an Eastbourne based mixed Border Morris side. A group of step-clog dancers using traditional, mainly English clog steps as a base. 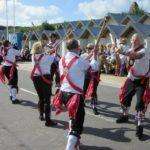 A mixed Cotswold Morris dance side based in Sailsbury. A Ladies dance side performing dances from the North of England. A Ladies group dancing mainly in a Southern style. Their dancing style is based on traditional Appalachian steps and incorporating other percussive forms of dance. A junior folk dance side based in North Dorset, mostly made up of girls between the ages of 4 and 14, although more boys have joined the group. They perform mainly traditional English / Dorset folk dances. They perform high energy, Traditional Step Clog Dances from the British Isles, English Music Hall, and from America and Canada.